A three-day training programme on climate change adaptation for trainers was inaugurated at the Institute of Cooperative Management (ICM) premises at Lamphelpat in Imphal on Wednesday. 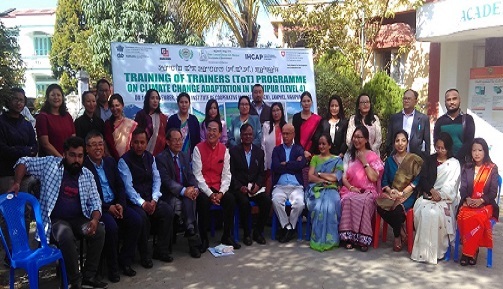 A three-day training programme on climate change adaptation for trainers was inaugurated at the Institute of Cooperative Management (ICM) premises at Lamphelpat in Imphal on Wednesday. The objective of the programme is to create awareness and sensitisation on climate change besides providing better information on climate change and adaptation issues. It will conclude on November 16. Many professionals mostly college teachers from various parts of the state participated in the programme. Speaking at the inaugural session, Director of Environment Y Nabachandra Singh highlighted the importance of understanding the issues of climate change and adaptation process particularly in the fragile Indian Himayalan Region from where major rivers of the country originates and around 440 different ethnic communities reside. Director of ICM Imphal Dr N Ranjana felt it mandatory for the trainers particularly the teachers to go through the topic of climate change while studying the teachers training programmes considering the necessity of the issue in this changing environment. General Manager of NABARD regional PN Praveen Kumar highlighted NABARD’s contribution in the ongoing projects on rural development, climate change and other livelihood projects for the tribal people besides doubling farmers’ income and sustainable agriculture. NABARD also promotes self help groups which is the world’s largest micro-finance groups having 12 crore members in the country. Earlier in his key note address, Deputy Director (Environment) Dr T Brajakumar highlighted the necessity of holding such programmes. These training programmes are envisaged at creating a pool of master trainers for autonomous replication in each state beyond the support of IHCAP which has been providing support in designing and developing such training programmes. Earlier orientation programmes for legislators and senior bureaucrats followed by state level and district level officers were organised and now the authorities are targeting trainers who were drawn from training cells of departments and experts from universities and institutes.